illustrations; a variety of limited edition aviation art prints available. 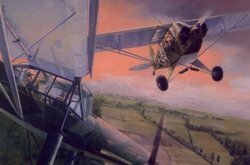 Burt has been a free-lance illustrator and commercial artist nearly all of his working life, but aviation art takes almost all the time he put in at the easel, now. In order to qualify for display or reproduction, his work must involve most of the following criteria: it must be educational, entertaining, celebratory, explanatory, historical and emotionally evocative. 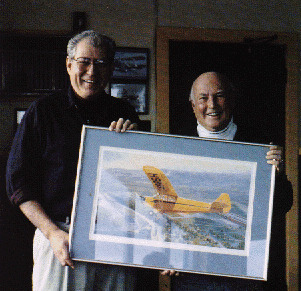 Lately, his interest in light planes has led him midway through a handful of joyful paintings, mainly Piper classics. Certainly there are dozens of military and general aviation machines that interest him a great deal, as well. "As long as I’m involved in planning, gathering background material and data, or executing a painting or marketing prints, it’s pure enjoyment to me. I’m often asked how long a painting takes, or where all the patience comes from. I’m being honest when answering: It’s like asking a has-been circus performer why he keeps shoveling up behind the elephant, and doesn’t get a real job. "What, and quit show biz?" It doesn’t take patience, it doesn’t feel like work, and it’s only tiring when you forget to stop and sleep sometimes - it’s like the things that you enjoy, and can’t bear to stop. So, it's not patience -- I love this!